Last year, in the Great American Beer Festival’s most-entered category, BNS Brewing & Distilling Co. earned a gold medal for its Revolver IPA, beating out 335 other entries from across the country. At this year’s event, you wouldn’t have known it. Over the course of three days, festival goers appeared to largely ignore the Santee, California, brewery’s table in section N, instead passing it by and opting to wait in line at nearby booths held by Ballast Point and The Bruery. On opening night, while BNS had its space manned by two GABF volunteers, there was no visible mention of 2015’s IPA prize, only the scribbled names of each of the beers for sampling written in black marker on the table in front of them. “It did?” asked a surprised volunteer when told about last year’s win. Beer lovers stayed just as oblivious, missing their chance to sample the top-judged beer of the country’s defining style. That was the case throughout the festival for BNS and others who were caught in a self-fulfilling prophecy created by drinkers more attuned to big names and hype surrounding certain beers. Lines looped around giant concrete columns and jutted out into walking areas between sections as people waited for their chance to taste something new or rare. Lines were continuously packed for hours on end at Goose Island Beer Co., Ballast Point and Jacob Leinenkugel Brewing Co. About 50 people continually waited patiently to catch a glimpse of Zac Hanson personally pour Mmmhops, a pale ale created by the pop trio Hanson Brothers. On the final day of the festival, Patrick Perrin and Derrek Armer lightly jogged from the entrance straight to the booth for Lost Abbey, where about a dozen people had already lined up. They wanted to try Cable Car, a highly-regarded wild ale made more attractive by its lack of distribution. At the booth next door to Lost Abbey, Phantom Ales volunteers stood quietly at the ready to pour the first beer of the day. “There are so many new breweries popping up, it’s hard to keep track,” Perrin said. “Yeah, I’ve lost touch,” Armer responded. Within minutes after the start of each session, about 100 people lined up to get one-ounce pours of Pliny the Elder double IPA and Temptation wild ale from Russian River Brewing Co.
“How’d you like to be the guys next to them?” someone asked from the back of the line at Russian River. At BNS Brewing’s table, a new addition appeared on the brewery’s sign on the final day of the festival. In thin black marker, “Gold Medal” was written next to Revolver IPA. “Silver Medal” was added next to Gatling Gun Imperial Stout, hardware earned hours earlier at the award ceremony. The small change in presentation didn’t amount to one in execution, however, as the line at BNS unfortunately, somehow, stayed empty. History repeats itself like years ago with brews from the past. It probably didn’t help BNS that a majority of attendees were using the GABF app and the winner list didn’t even appear in the app until half way through the afternoon session. Not to mention that a lot of the medal winners weren’t on the list that that they published to the app. This includes BNS’s gold medal. Funny thing about Pliny at the GABF. There are bars right in downtown Denver that serve it daily, at least during the 4+ days I spent downtown. Last year a buddy was chatting with someone in line waiting for Pliny, and he told her “go to xyz bar and get a full glass – grab (a more rare beer) instead.” She grabbed Pliny. I find you have to be aware of the beers first, If your not familiar with the brand, its a tough sell, even at the brewery level there are so many new breweries to try, We just got around to Troegs, even though its a nearby location, now it’s one of our favorites, but they should have had banners hanging over the previous winners for sure. Pour & they will come may work for the better known breweries. But, more knowledgeable pourers & better booth marketing would help less popular entrants. yeah that seems like a marketing fail on BNS’s end. I mean, a discerning craft enthusiast would look at the previous year’s winners list for their favorite styles and make a list to explore, but I doubt, outside of some curious brewers from other breweries, there would be many ‘general attendees’ with such curiosity to avoid the whale mentality and spend more time actually tasting beers than waiting on lines. But that aside – its a brewery’s job to utilize that GABF Gold momentum properly and find ways to get it out there besides relying on a festival app which may (or it sounds like in this case) may not always deliver on selling their beers for them. Yup, Hollywood-style stardom is a reality in craft beer nowadays. 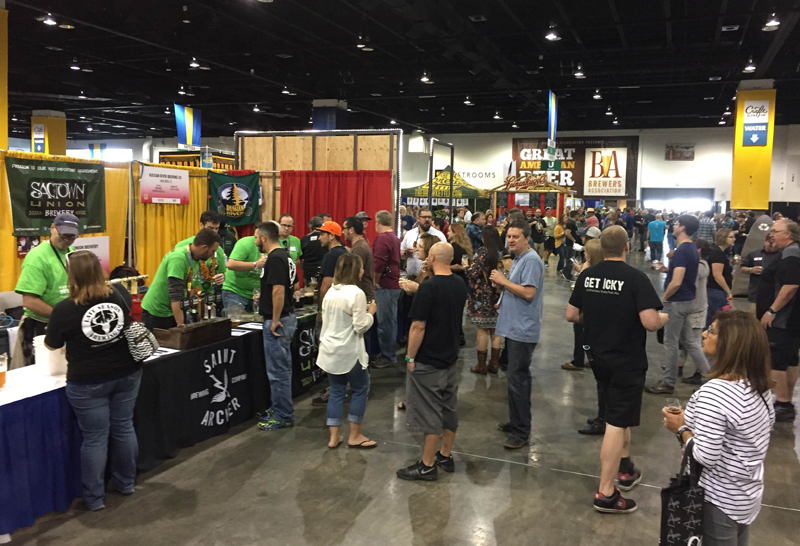 Besides GABF, two of the best places to experience it are here in California at a Pliny the Younger release (especially on Day One) and at the California Craft Beer Conference in Sacramento. After Two Beers with Steve Dresler of Sierra Nevada Brewing Co.